To protect the machine and reduce collision noise, the ball casters are damped. 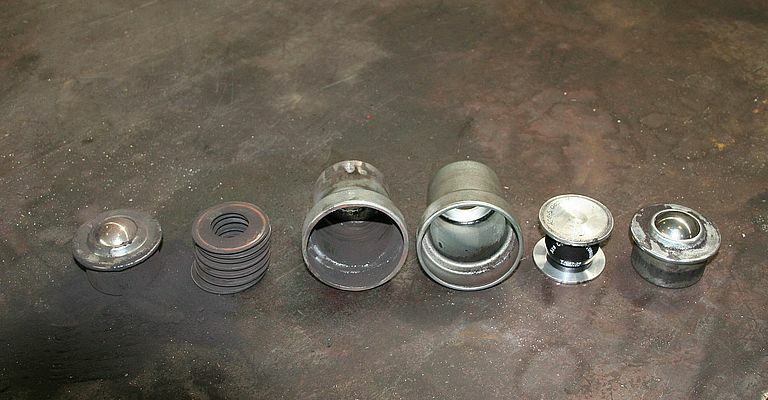 In the past, this damping took place using spring assemblies (left), which caused great wear and tear as well as noise pollution. Now, TUBUS profile dampers made of co-polyester elastomer have replaced the metal solution. 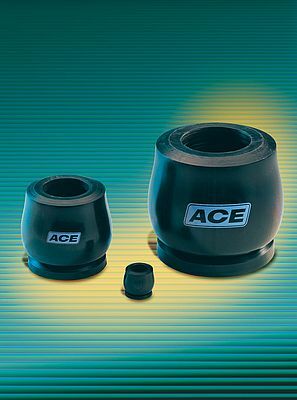 The TUBUS TA series: This type of profile damper from ACE is reversible, and absorbs the generated energy with a declining characteristic line. Metal rods weighing up to 370 kg clatter onto ball casters in freefall. Even if the drop is only 20 cm, you can imagine what kinds of forces are involved here, and the kind of noise they produce. At the Liège based factory of the Magotteaux Group in Belgium, TUBUS profile dampers from ACE Stoßdämpfer keep these forces from damaging machines and ear canals. The Belgian company, which offers solutions for wear and tear in machines that are used for crushing and grinding raw materials, among other things, is one of the world's market leaders for these products. The Magotteaux systems and services are used in areas ranging from mines to the recycling industry, from coal-fired power plants to fracturing work, always in keeping with the motto, "Delivering the best product for the customers' specific needs." In this specific case, the company was aware that the spring assemblies were not the best possible product for equipping their machines. 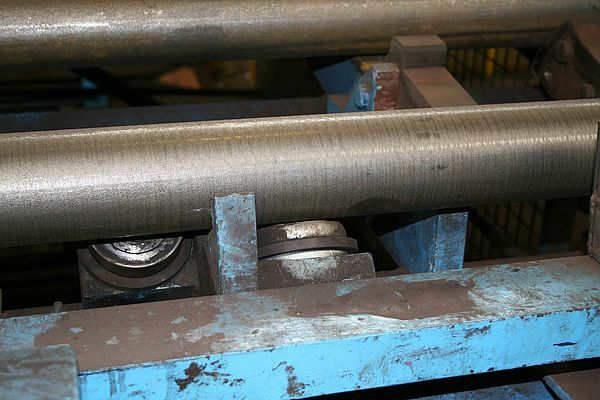 Michel Hampert, the responsible project manager at Magotteaux, looks back at the situation: "The unnecessary rebound and particularly the loud movement of the workpieces as they moved and crashed onto the ball casters, were probably due to the damping solution we had originally chosen. But we didn't have an immediate in-house solution for this problem." For that, they paid a visit to ACE Stoßdämpfer. The company has a separate office for the Benelux states. Damping specialists Ralf Küppers and Han Titulaer looked into the matter. The resulting technical parameters produced an initial design. After coordinating with Michel Hampert, the choice fell on TUBUS TA 47-20 profile dampers. The ACE specialists knew from comparable cases that the co-polyester elastomer used in manufacturing these axially damping parts, which can be upgraded at any time, was greatly superior to the springs. They also knew that they could be integrated into the existing construction in a very short amount of time. That was the first nice surprise for Michel Hampert: "Assembling and disassembling the TUBUS only required four parts; with the spring assemblies, it was 12 to 15. You can imagine which process was faster." The TA series of these machine elements is especially well suited in this case because it has a declining damping characteristic. In other words, there is a particularly large energy absorption at the start of the stroke. At the same time, the elements can resist several million load changes before they need to be replaced. Since they are also much more cost-effective compared to hydraulic end-position dampers, for instance industrial shock absorbers, Michel Hampert's team at Magotteaux was convinced. Ralf Küppers and Han Titulaer also pointed out that the TUBUS profile dampers are ideally used in cases where the precise stopping position is not as important. 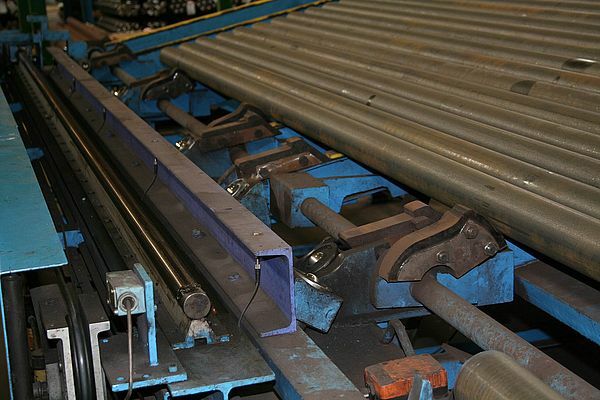 Once the TUBUS TA series was installed, the previous ricocheting of the metal rods meant that the formerly significant rebound was greatly reduced - so the ACE clients are very satisfied with the solution. With an outside diameter of 47 mm and a stroke length of 20 mm, the values achieved by implementing TUBUS are impressive. At a maximum collision speed of 5 m/s, they are able to absorb 140 Nm/stroke. In the event of an emergency shutdown, this value even increases to 173 Nm/stroke. That means ACE's machine element, with an operating weight of just 80 grams, can easily handle metal rods weighing up to 370 kg. Michel Hampert confirms this: "Even after eight months of use, we have not had any more downtimes with the ball casters." The same is true of the machine base. Here, too, things were very different during the era of the spring assemblies. The machine load and the supporting force acting on the machine were significantly decreased by the construction with the TUBUS design. In the meantime, the technicians have also installed additional plastic plates between the cabinet and the machines so that the machine can be perfectly adjusted and can run without downtimes. With that, the main goal of the retrofitting has been achieved - but the Magotteaux team has another pleasing benefit to report: "With the TUBUS, the clanging of the metal rods is only half as loud as it was, maybe even less." The noise can no longer be heard from the neighboring building, and people can work more efficiently because things are quieter. Michel Hampert is impressed by the cost-effective, efficient solution, and he also points out that the ball bearings have not suffered any further damage since the TUBUS was installed, which means a longer operating life and better maintenance intervals for the machine.